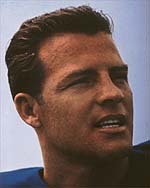 After an All-America college career at USC, halfback Frank Gifford was an offensive force for the New York Giants in the 1950's and 60's. His career highlights include close to 10,000 combined yards on offense, seven Pro Bowl appearances, and four years as a member of the All-NFL team. He was inducted into the Hall of Fame as a member of the Class of 1977. 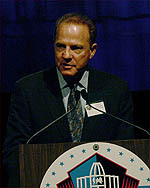 Frank later went on to become an accomplished sportscaster, including 27 years as a part of the broadcast team for ABC's Monday Night Football. FG: Professionally, it was Jim Brown, who I think is the greatest player of all-time. He seemed to always give us a hard time. They all gave me a hard time. FG: Oh wow. If I had to pick, I just couldn't pick one. I'd have to pick three of them - Steve Young, John Elway, and Dan Marino. And I would not say they would come in that order. If there was a game on the line, you'd want a Steve Young or a John Elway. They could beat you in more ways than one. And they are just winners. FG: Well, it depends what kind of celebrity. It sometimes becomes tiresome. Sometimes you want some private time with family, your kids, and friends. But it comes with the territory. I was fortunate to play at a high level in high school, a high level in college, and a high level as a pro. It comes with the territory. I find, though, most people are really nice to me. Most people are friendly, and warm. If ever intrusive, it just goes with the territory. FG: Well, I think in any position, the player is better, better equipped to play. He's a professional year round. Very competitive. The athlete today is better than when I played. Plain and simple, they're better. And the players a decade from now will be better than the ones now. Do they have more fun? No. We had a much better time playing the game compared to the players who play today. FG: We knew Vince Lombardi different than the Green Bay Packers did. He was a very dear friend of mine, a friendship that lasted through his years with Green Bay. I was with him just before the end. Over the years I've read accounts of him, and I don't understand. He was very intelligent, very spiritual, a very dear friend of mine. If anything from what I read, it was a misrepresentation, exploitation. He was a great man. FG: That's not even a problem for me. Jimmy Brown. He was not just a great running back he could play any position. He could run a 9.7 100. He was a great athlete in other sports like lacrosse and basketball in high school and college. There was no one quite like him and there hasn't been either. FG: Well, that's a tough question, to beat your own drum. In terms of football, I came into the game in the early 1950s when it wasn't as popular as today. I think I helped make it that, not only me, but a lot of others also. I had the good fortune to go off the field to the broadcast booth and I contributed there. I look back with great pride, not just personal accomplishment, but that we helped make pro football the most popular sport. FG: I've always been a big admirer of Pat Bowlen, number one. And Mike Shanahan, number two. They're still in a stage of transition. When you lose a player of the stature of John Elway, it's a tough transition. But, I'm looking forward to Monday night when they play the Giants. I've been away on vacation in Europe and haven't had time to read or see a lot on them this summer. I noticed one thing, though, a tabloid in New York today had their "experts" - and I use quotes on experts - and every one of them picked Denver. If I were a Bronco, that would make me worry. FG: A multitudes of reasons, they've lost respect. You get beaten like you did in the Super Bowl and it kind of burst the bubble in New York. But, you can't ignore what they did to get there. I saw all their home games last year with my 11-year-old son Cody. They picked the wrong team to be sloppy against - the Ravens. The Giants played poorly and they know it. They have the basic team back and they know they can win. I don't think you can certainly write them off.